Last year Intel unveiled a ’28-core’ processor aimed more towards enthusiasts and professionals rather than for servers. Despite the initial demo having a tenuous overclock and setup, we were given the specifications: 28 cores, running at a 3.1 GHz base frequency, a 4.3 GHz turbo frequency, a 255W official rated TDP, unlocked for overclocking, and ECC support for its six-channels of DDR4-2666. Pricing is still an unknown, and at the time Intel said it would be ready by the end of the year. That did not happen, but we still saw a couple of systems at CES which shows that it is close. 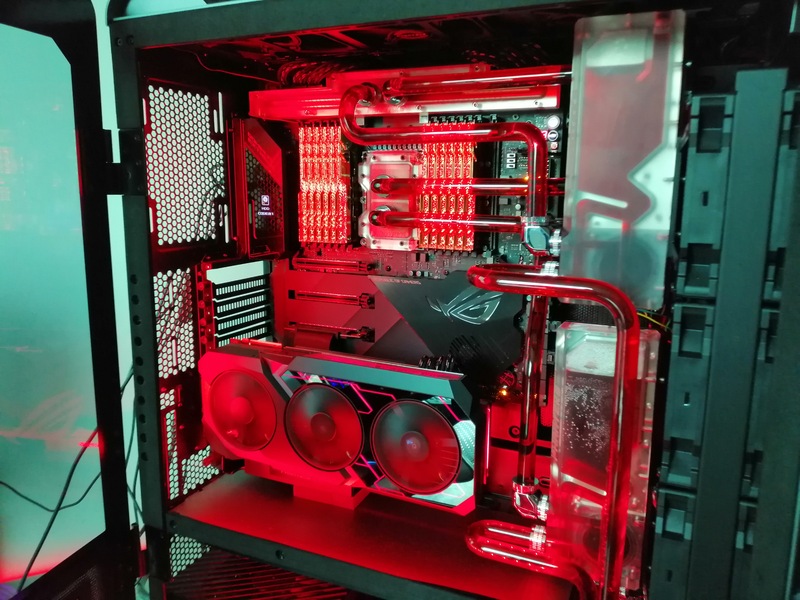 At the original demonstration in June 2018, we saw that both GIGABYTE and ASUS were the motherboard partners for this project. We got a good look at the GIGABYTE motherboard that was running the chip at that sky high 5.0 GHz, but it seems that the motherboard is still not ready for primetime, as no-one had it on display at CES, and it doesn’t even yet have a name. Instead we got an eyeful of ASUS’ Dominus Extreme in every W-3175X setup that was on display. For users who have never heard of the Xeon W-3175X before, this new processor from Intel was somewhat of a surprise when it was first announced. It is Intel’s highest core count processor from its Skylake line of processors, and essentially a repurposed $10k server processor for the enthusiast/professional market. Intel has taken the silicon down to its Xeon W line, which is normally for workstation processors, but in this case they have also allowed the processor to be overclocked, the only Xeon W processor capable of doing so. Users have cried out for an unlocked version of Intel’s highest end server processors, and now this is it. Xeon W-3175X LGA3647 28 (56) 3.1 GHz 4.3 GHz 255 W $ ? Core i9-9990XE LGA2066 14 (28) 4.0 GHz 5.1 GHz 255 W $ ? The new processor requires an LGA3647 motherboard, but as far as we are aware it will not work in any standard LGA3647 motherboard, but specifically either the ASUS Dominus Extreme or GIGABYTE’s yet unnamed product. Intel guarantees a TDP of 255W for the base frequency of 3.0 GHz (see our post here as to why TDP only refers to base frequency), and a turbo frequency of 4.3 GHz. At this time we do not know the turbo profile of the processor, however we expect it to draw more than 255W at its peak. When overclocked, expect it to draw a lot more. For context, Intel’s 28-core 5.0 GHz demo was using a 1600W power supply and an 1800W water chiller to keep the processor cool. The color of gaming is red, and so ASUS ROG build using the Dominus Extreme was a system decked out in full red. 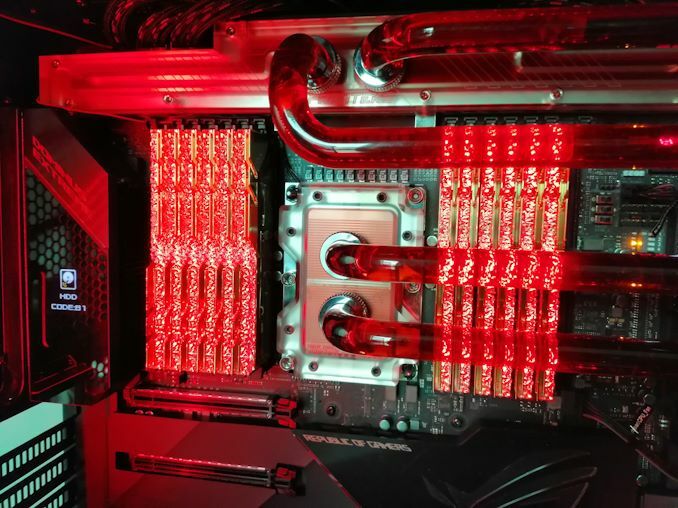 The liquid cooling loop was red. The LEDs on the system were red. Even the memory, from G.Skill’s recently released Royal line, was red. Normally red in the animal kingdom signifies danger, but for personal computers, it means gaming. 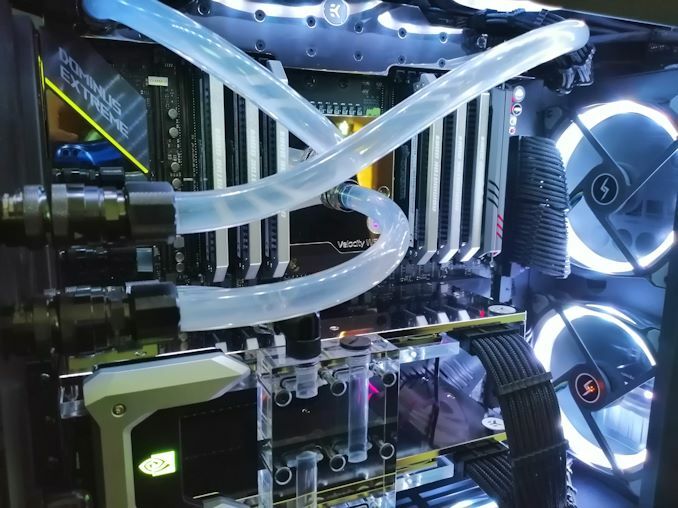 On the top is one of EKWB’s water blocks covering the 32-phase power delivery, and the full system is paired with ASUS’ new ROG Matrix Geforce RTX 2080 Ti graphics cards. For memory, we see 12 x 16 GB = 192 GB of DDR4, which is almost enough for almost everyone. The system was powered on, but not connected to anything. It didn’t even have a HDD, as given by the POST code shown by the OLED display on the top of the IO cover. This means it got past the CPU POST section, so there was definitely a CPU in there. Instead of going for red, Digital Storm showed its new Corsa platform in white. 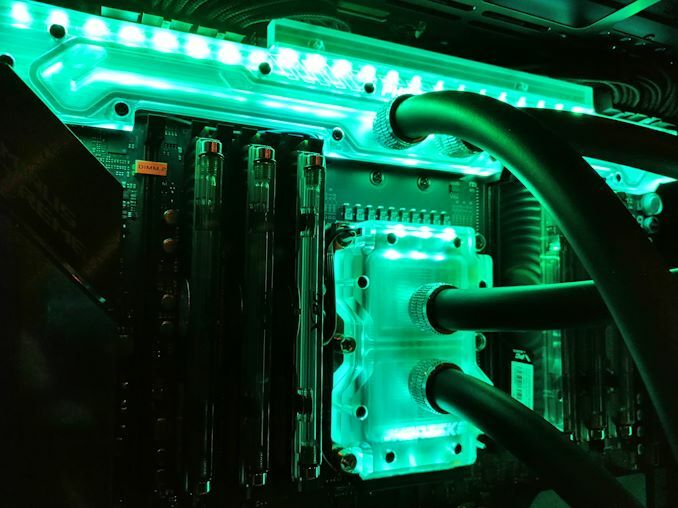 This means fan LEDs in white, liquid cooling tinted white with white LEDs, and silver tipped memory to reflect the white. Inside the system we saw six Corsair Dominator DDR memory modules, and something in the special NVMe slot that ASUS uses on its motherboards. The system also had two RTX 2080 Ti graphics cards inside, both water cooled. There is a total of sixteen 120mm fans here, with plenty of cooling focused into the radiator and pumps at the rear, but a solid airflow for the full system nonetheless. 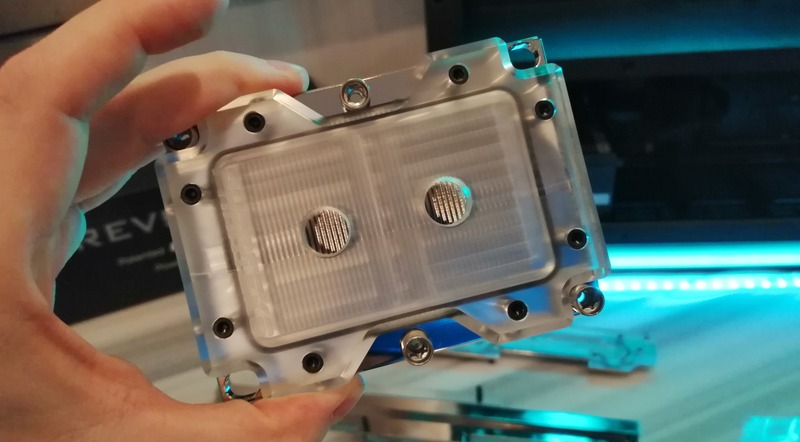 At the top we also see EKWB’s waterblock for the VRM. Digital Storm told us that this specification of system will be around the $20k mark, however the Corsa will sell with a variety of platform options, ranging from $6k for the entry model up to $50k with maximum everything plus custom color options and decals for the case etc. This time we’re seeing a system go green. Phanteks’ setup was more to show off its chassis than the system, which is understandable given that Phanteks wants to sell you a case. Inside was a custom liquid cooling loop using Phanteks’ own CPU block, VRM cooling, and radiator/pump combination. 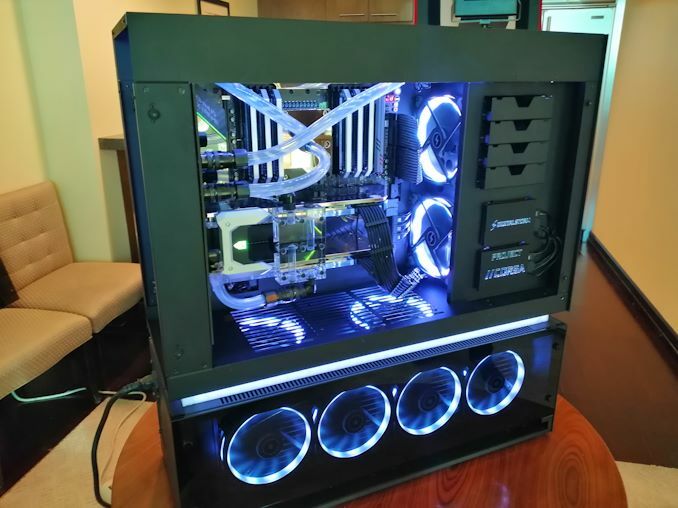 Phanteks was also keen to show that this system supports multiple power supplies, and its Revolt Pro line which can join multiple power supplies together to give sufficient power as well as required connectors. The ASUS motherboard has two 24-pin connections, one for extra overclocking, to which Phanteks states that they have the ideal hardware for such a setup. Intel said that the W-3175X would be available in Q4 2018, which has passed and gone. We’re being told that the product is still coming, with both Intel and ASUS looking to iron out wrinkles before bringing it to market. We have been told that the chip will be sold on its own at retail, however the preferred method of purchasing will be through custom builds from system integrators, such as the Digital Storm Corsa seen above. GIGABYTE is still working on their motherboard, which does not yet have a name. We’re looking forward to seeing how Intel will distribute the platform and how it performs. To be honest, unless the user has some specific Intel-optimized code, I see no reason to buy such a platform (CPU + mainboard) instead of AMD ThreadRipper. IMHO, there is zero benefit from such a solution, outside the particular cases where the code is Intel-specific. And I'm not saying #AMD is going to "crush" anybody. These are high-end solutions therefore neither Intel nor AMD are willing to sell these for cheap. Prices will be high on both sides, performance will be good as well. It's just that on the upgrade-ability side and often on the performance & efficiency side, AMD has the better solution. Your claims are simultaneously wrong, and are pointless anyway. In real life, the vast majority of software still runs with a higher level of performance, in most situations, with Intel's particular design philosophy (monolithic) and emphasis on single core performance. In other words, people running Adobe, Autodesk, Avid, Foundry, Accelrys, Matlab, etc. software/packages in Windows (substantially more than 70-80% of professionals) will either experience no meaningful benefit with Epyc or threadripper..... or will experience a meaningful DECREASE in performance compared with a comparable i7, i9 or Xeon. Until both Microsoft and everyone else not only optimize for large core count (Which would help everyone), but also optimize for the multi-die architecture used with AMD chips (eg "the scheduler"... optimizing based on a completely different way of scaling core count that involves very careful consideration of memory timing/latency/priority/etc), then there is no benefit and there is only downside. The 2nd point is the efficiency. EIther you are uninformed or trolling. The TDP on 32 core Epycs and Threadrippers is basically the same. ~250 watts. this one says 258. It is known that AMD 16+ core chips idle power consumption significantly exceeds that of comparable core count intel chips due to the power requirements of the memory controller constantly operating in the background and pumping out the clock signal to all those dies. Its at least 2x. eg an Intel chip might use 10...20...30 watts. Epycs and Threadrippers use 50~60 watts or more at idle. you are probably idling 10-30% of the time. (for example, when you are asleep!). "The TDP on 32 core Epycs and Threadrippers is basically the same. ~250 watts. this one says 258." 1)The TDP Intel lists is the BASE CLOCK TDP, AMD is much more on the money with actual real-world TDP. 2) They disclosed the actual specs on that demo unit, it was using 1800W of cooling, even as a safety margin you don't over design a cooling setup by 500% of need. Based on the similar parts this is cut from, the system will easily draw over 1kW at max clock speeds. The CPU alone is more likely in the 400W range. I wish people would stick to topic and not bring up fanboy stuff - I believe only discussing topics outside if some one deliberate pulls up a message - that talk about subjects. For example, I will not bring up Intel in a discussion about new AMD product - unless someone else brings it up. How much time did they have to catch up now? Eleven or twelve years since Core 2? With Intel basically doing nothing but polishing the mostly same architecture since 2011 (or whenever Sandy came up).